Quick write-up tonight, as the puzzle was almost an hour late in being released. The theme is ROULETTE, and there is an uncomfortably square “roulette wheel” in the center of the grid. The key things in roulette are even and odd numbers and red and black spaces, ergo BLACK GOLD, RED SNAPPER, EVEN-HANDED, and “ODD, ISN’T IT?” as theme answers. The word [Homie] has got to stop being used in clues for BRO or HOOD or anything else with origins in African-American slang. You know who uses “homie” now? According to my teenager, nobody. Nobody except white people writing crossword clues? “BE MAD” (9a. “If you want to throw a fit, fine”]) isn’t really a crosswordable phrase. “Be that way” would be worlds better. The “Var.” tag, never welcome, adorns TIPI‘s clue here. 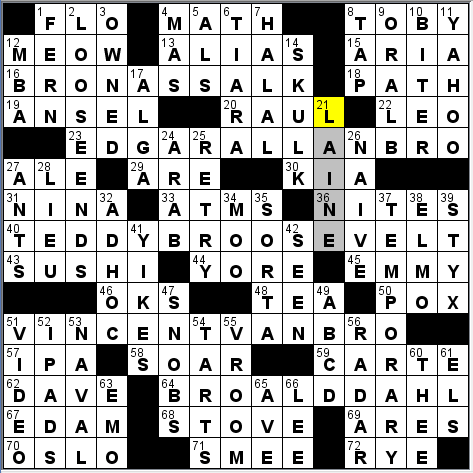 Besides TIPI, there are other things I’m surprised to find in a Tuesday puzzle—ABEAM, ACERB, SANA, SMEE, SAS, ENO. And I’m docking points for OSH, clued with no space between the “___” and “Kosh” because OshKosh is one word. It’s a weird grid for a Tuesday puzzle, with those corners of 7-letter entries being more common for a Thursday. 12d. [Hazardous mailing], ANTHRAX. Sheesh, what sort of mail are you getting, Will Shortz? I like NICE TRY, DARK HORSE, and PANASONIC. Oh, and MIXTAPE, which is a thing that was huge in the ’80s. The last mixtape I got was a mix CD, about two years ago. There is a rap connotation, with artists putting out playlists of songs and calling it a mixtape. And! Selected Urban Outfitters stores will be selling cassette players and music cassettes to today’s younger generations, who will finally get to learn first-hand about tightening a tape with a pencil in the spool. 3.5 stars from me. Good night! Welcome to Mary Lou Guizzo making her WSJ debut! Today she offers up a beautifully-executed theme and a solid, clean grid for our enjoyment. Mary Lou (along with co-constructor Jeff Chen) was behind the wonderful THE DESCENT OF MAN puzzle which appeared in the NYT just over one year ago and which was nominated for 2014’s Orca Award for Best Easy Puzzle. The idea behind today’s puzzle is similar to that one, so it’s natural to compare the two. 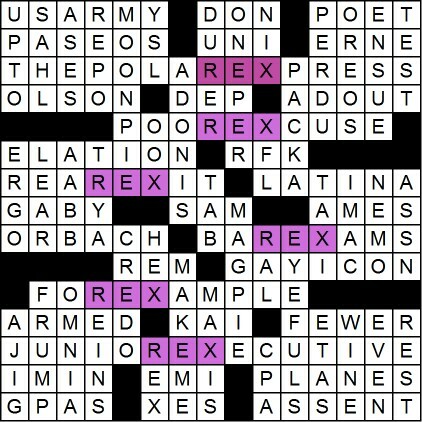 In both puzzles, a three-letter word appears sequentially in five grid-spanning, vertical phrases. Back then, the word MAN descended from the top (in MANIFEST DESTINY) to the bottom in the revealer (THE DESCENT OF MAN). Today, we have a CON rising up sequentially from the bottom to the top. 3D SIR FRANCIS BACON [Philosopher considered the father of empiricism]. Lovely. 4D EMERGING ECONOMY [Brazil or India, to an investor]. I think I normally hear the phrase EMERGING MARKET, so this one’s not quite as good, but still fine. 9D BOA CONSTRICTORS [They might have a crush on you]. Pluralized, sure, but solid and so nicely clued. 11D CON SEQUENTIALLY [As a result, and a hint to a three-letter chunk in the five long Down answers]. The adverb CONSEQUENTIALLY is re-parsed as two words, implying that we’re looking for CON found SEQUENTIALLY in the theme answers. See how they flow? The great: The themers are all very good grid spanners and the theme is completely hidden until the revealer tells us what to look for. That’s the way it should be. CON is pretty much hidden from view in each of the theme answers, so it’s not until you come to the revealer and re-parse it that you know what to look for. The good: The grid is mostly free from dreck which is pretty remarkable with five grid spanners. Sure, there’s ELS, IRT, BTO, XII, TMAN, RSS, but all that’s acceptable with an ambitious theme. Plus, we’re told to GO FOR IT right in the middle of the grid. I also like FRO-YO and DA NANG (which is just fun to say). The not as good: CON SEQUENTIALLY is not as good a revealer as THE DESCENT OF MAN. Yes, the CONs are in sequence, but the revealer doesn’t really define what that sequence is as tightly as last year’s puzzle did. There’s not a lot of reason or meaning behind CONs ascending through the puzzle (unless they’re coming up out of the sewers a la “Shawhank Redemption”). Plus, it would make more sense if the revealer was CON SEQUENCE; that would just feel better (but that’s not a grid spanner). Still, a nice solid grid with an ambitious theme, a fun AHA revealing moment (though not quite as fun as the MAN puzzle). 4 stars from me. Oh, I would be remiss if I didn’t mention 1D which has the same clue as yesterday’s MAMAS [Half of the “Monday, Monday” singers] but a different answer (PAPAS). Nice. The”Royal Treatment” of title alerts us—and the reveal at 63D. [Name fit for a king (and a hint to the puzzle theme)] confirms—that REX is the “royal” in question. He’s discreetly hidden in plain sight, too, within six themers (two grid-spanners). Whence the seven requests at the top (more likely to occur in checkers than in chess, where you’re probably gonna promote your pawn to a queen…). But to the puzzle at hand, do note how the theme letters always span two words and are never directly embedded in one word. Classes up da joint! 17A. THE POLAR EXPRESS [Christmas film with Tom Hanks in six distinct roles]. Never saw it, but rather love the gorgeously illustrated, award-winning picture-book by Chris Van Allsburg it’s based on. 23A. POOR EXCUSE [“I forgot,” for example]. Which elicits seriously smile-making memories of early Steve Martin (see last paragraph). 31A. REAR EXIT [Back out?]. Not easy to parse (whence the “?”). Implied is the word “way”—as in “back way out” (i.e., the way out that’s in the back). So this is not about reneging and makes for a great use of the question-marked clue. 45A. BAR EXAMS [Practice tests?]. Law-practice tests. Another cluing goodie. 51A. FOR EXAMPLE [e.g.]. Okay. Because they’re not proximate in the grid, I didn’t notice until actually culling together all of the themers that we see this answer in its entirety within the clue for 23A. (making me think this may not be so egregious a flaw). Different editors and constructors have different feelings—strong on both sides—about this kind of internal “duplication.” We also see the clue [Packing heat] for ARMED, and then the fitb [PACK A bag (prepare for travel)]. Me, I don’t love it, because it can be avoided, but neither do I lose much sleep over it. I simply don’t prefer it. 62A. JUNIOR EXECUTIVE [Young supervisor]. Not as evocative as the matching 15-er, but solid nonetheless. 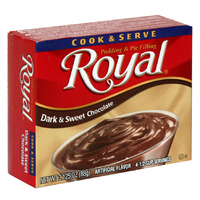 So, no REX Parker tribute nor Royal Pudding shout-out. Still: tasty in so many ways, with plenty treats remaining to be savored. FOR EXAMPLE: MOONPIE and ADONIS which (in their own unique ways) provide EYEFULS; ELATION, which many folks experience when listening to GAY ICON [Bette Midler or Judy Garland], and others while appreciating straight ICON [Broadway / TV star Jerry] ORBACH; the bratty (indeed) “MAKE ME!”; that excellent [Private employer?] U.S. ARMY combo; and not “The Thieving MAGPIE,” but here’s the Ren and Stimpy (truncated) version just for fun. TAXI. Why? Well, there it is clued as [Uber rival] and I was feeling so smug, because (though I use neither) I’d remembered LYFT… But ’twasn’t to be. Got me! Oh—and got me again with REINS [Pulls (in)]. First choice, REELS; then EARNS. I always tend to TEST [Try out] a couple of letters, by checking the crossings to see if I’m on the right track. This one took a little doing. FRUMP. Now there’s a word we don’t see a lot today. Seems to have had its heyday a hundred years ago, but sometimes it’s the best word to use, especially (as clued) for a certain makeover “before”-type. FRUMP. Almost has an onomatopoetic resonance to it, the way it lands with a dull thud. And then there’s Bud FRUMP, workplace nemesis of J. Pierrepont Finch in Frank Loesser’s How to Succeed in Business Without Really Trying. And, as always, it’s that “association game” that makes the solving of puzzles an even richer experience, no matter where you draw your associations from: fine arts (DÜRER), sports (XFL), classic R&B ([“TRY A Little Tenderness”]) or classic sacred music (CREDO [Part of Beethoven’s “Missa Solemnis”])—just to name a few. I’ll go out today leaving you with one final association that ties the theme word REX to classic sacred music. Don’t be afraid! Sang this while in college glee club (maybe you did, too?) and have been in awe of the whole work ever since. From the Berlioz Requiem, the “REX tremendae.” It’s “majestatis” indeed—so til next week, happy listening and solving! Another clever entry from Matt this week. The four theme entries all have the letters “GO” added to a familiar phrase. I always think that clueing these theme entries must be a lot of fun. Or really hard! 42A [“Them” versus “Arachnophobia” showdown?] FILM BUG-OFF – My favorite of the bunch! 55A [Chopping weapon for Ares or Mars?] WAR GOD CLEAVER – This one is also really good. 1A [Longtime “American Top 40” host Casey] KASEM – A staple of my childhood. Let’s not forget he was the voice of Shaggy! 24A [Cookie with a seasonal Pumpkin Spice variety] OREO – A fresh, and also seasonal, clue! 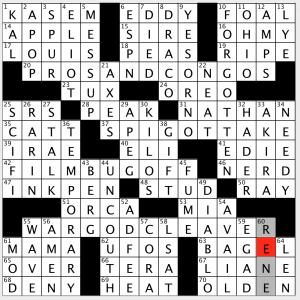 67A [Former “Weekend Edition” host Hansen] LIANE – I am thinking she is more familiar to the followers of the Sunday Edition Puzzle, a.k.a crossword solvers! 44D [Vulgar] UNCOUTH – I think my mother referred to me as UNCOUTH once or twice; maybe she didn’t realize what the word actually meant…! 49D [Don Quixote’s devil] DIABLO – Devil en Español is DIABLO. There was also a video game franchise of the same name. That I never played. A quick time on today’s puzzle, but it still didn’t seem overly easy. Until next week. Go CUBS! A musically themed crossword this Tuesday from Gareth. 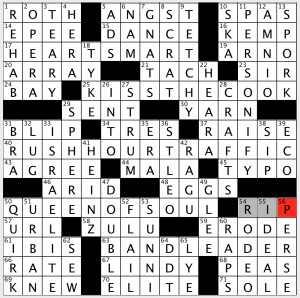 Another puzzle where that may not be readily evident, at least not until you get to the entry at 63-Across! So there is the band Heart in the first entry, with the famous Wilson twins; there is the band Kiss, with the unmistakable gaudy makeup; the band Rush, who I believe hail from Canada; and of course Queen, the band responsible for We Will Rock You, among tons of other great songs. I believe I have mentioned before that it is fun going through the puzzle, trying to figure out what the theme answers have in common, and then getting a nice a-ha moment at the end. Even more fun when they are starred, so you KNOW there is a link somehow! 34A [Chic modifier] TRES – This is very in French, and three in Spanish! 44A [ ___ fide: in bad faith] MALA – Not that common, but bailed out by a fairly common Latin phrase! 12D [Prenatal test, for short] AMNIO – Short for amniocentesis, a common test done to test fetuses for various things, including gender. 33D [Descendant of Jacob] ISRAELITE – In the Bible, Jacob’s name was changed to Israel after he grappled with an angel. Nice Tuesday puzzle. 3.8 stars for the nice payoff at the end! GO CUBBIES! As someone who once corrected a roommate that it wouldn’t be BROpolean Bonaparte, but Napoleon BROnaparte (to speak nothing of his chill wife BROsephine), this theme spoke to me in a very nerdy way. There was also a nice symmetry to the placement of BRO in the entries (whether that was intentional or not). The cluing on Buzzfeed’s puzzles, one of my sticking points last week, seems to be getting better. There’s more smoothness between editor and constructor’s voices, and there aren’t quite as many overly-long clues this time around (although a few of the jokes still come across as a little long – timing’s something that’s hard to do in printed form). One other thing I like this week was the way some common crosswordese is getting introduced in the puzzle in ways that relatively new solvers can start to pick up. 67A’s EDAM gets clued as “Cheese that’s made in reverse?”, a nice bit of wordplay that I didn’t pickup on first pass through. ORAL-B, another frequent entry that’s in this week’s puzzle at 9D, gets an on-brand “(hygiene FTW! )” at the end of the standard “Toothbrush brand” clue that many a puzzle before has used. If the puzzle can continue to improve like this, I look forward to see what still lies in store. This entry was posted in Daily Puzzles and tagged Ben Pall, Elizabeth C. Gorski, Gareth Bain, Matt Jones, Sam Buchbinder. Bookmark the permalink. Yes it is clever, but it has been clued that way before – by editor Eugene Maleska. 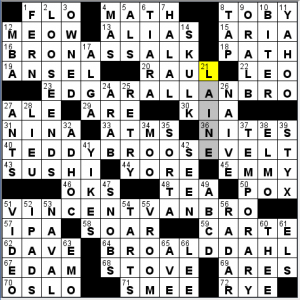 I didn’t mean to suggest the clue itself was new (although it was new to me as someone who was barely writing, much less solving, during the Maleska era), just clever and a nice “aha” for Buzzfeed’s solvers who might be starting to pick up the crosswordese that may be appearing more often. That’s ok. You weren’t the only one mentioning how you liked that clue. I just enjoy being the first to compare Buzzfeed cluing to Maleska. hmm. my al version has the title “Whattup Mah Dude.” this didn’t prevent me from solving or grasping the gimmick, but the actual title makes the BRO name-game much better/funnier. “Whattup Mah Dude” is the actual title – I think the version I solved from had an earlier version of the name. Still a good one, though! Concerning clue for OSH in NYT: on their website they call themselves OshKosh B’gosh with no space before the K. Clue looks okay to me in Puzzazz. Don’t understand docking points for it. I took Amy’s comment to mean that ___Kosh B’Gosh isn’t a valid partial because Oshkosh is a single word, regardless of how the company chooses to use capital letters. You can’t just sever a chunk of a single word and make it a crossword answer. 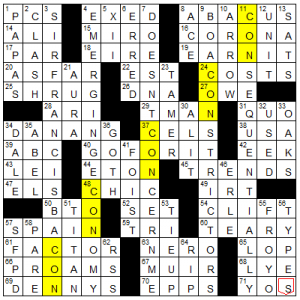 Have you ever seen one of those terribly misguided crap puzzles with answer/clue combos such as CONNEC [___ticut]? It’s not done in a decent puzzle venue when there isn’t a capital letter inside the word, and it really oughtn’t be done for ___Kosh, either. I am far from alone in disdaining that, I assure you. To be clear, you don’t think you should do this; it’s not that you can’t. WS treats this more like a hyphenated word because of the mid-word cap than the random letter string in “Connecticut,” lets say. SINO is almost universally clued as a FITB. Note that in every case the spacing in the clue is accurate (“___Kosh” vs. “___-Russian” vs. “___ States”) which to my way of thinking is enough. But the point is that we don’t get a vote since Will is cool with it. 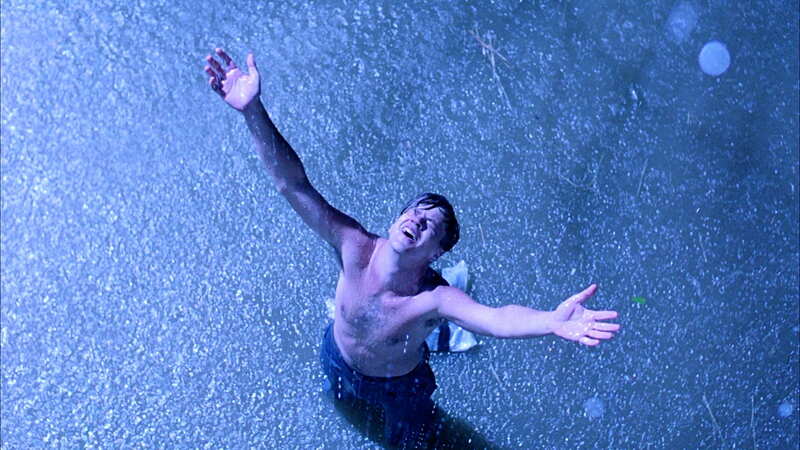 BTW, I changed my internet provider today (yay, I’ve joined the 20th century and now have cable TV! for the first time) so if anyone has trouble getting the Jonesin or other puzzles I host, you might have to reboot or wait for the DNS entry to refresh. 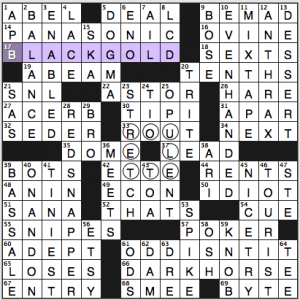 Bear in mind that the NYT is far from the only crossword venue there is, and there are other venues/editors that aren’t “cool with it.” As a crossword editor myself, I do get a vote, and my vote (along with my co-editor’s vote) is no. Of course. I meant we don’t get a vote about it in the Times. Can’t speak for Mr. Shortz’s policy, but there’s no logic in treating this like a hyphenated word, just because somebody stuck a capital letter in there. Unlike a hyphenated word, neither part of this – “Osh” nor “Kosh” has any meaning on its own that I’m aware of. Maybe you could justify this for something like BlackBerry, but I still think it’s questionable. Derek – you are obviously a white guy, and you obviously aren’t from Down South. That’s why neither you nor anybody you know uses the work “tetchy”. I assure you, you couldn’t be more wrong on the first count. Derek is pretty obviously a black guy in person. But yes, I think he’s a Midwesterner like me, and not a Southerner. As another counterargument, this non-black Yankee is familiar with tetchy. And has never considered it to be associated with any racial demographic. It’s a distinct word, not just a rustic pronunciation. “Presumably from Middle English tatch, tache, tecche, teche ‎(‘blemish’), influenced by touchy, from Old French tache, teche (Modern French tache), from Vulgar Latin *tacca, from Gothic [non-reproducable characters] ‎(taikns, ‘sign’) (compare Old English tācen ‎(‘sign, token’), Modern English token), from Proto-Indo-European *deik-. Growing up in the Midwest and living on the East Coast, I had never heard the word either, but just read it a few times in a recent Bond review in a British publication. might want to check your grid there, ben. 14D SKULK, 20A RAUL, 21D LAINE, 30A KIA, 36A NITES. although since i didn’t know raul or cleo laine, i kinda like your solution better! I passed out directly after work yesterday, so I forgot I had a puzzle. There is a bonus in the theme. BTW, my biggest struggle in designing this puzzle was deciding on bands big enough to be nigh universally-known! The end of RUSHHOURTRAFFIC is also a band.